Does it get any better than that? 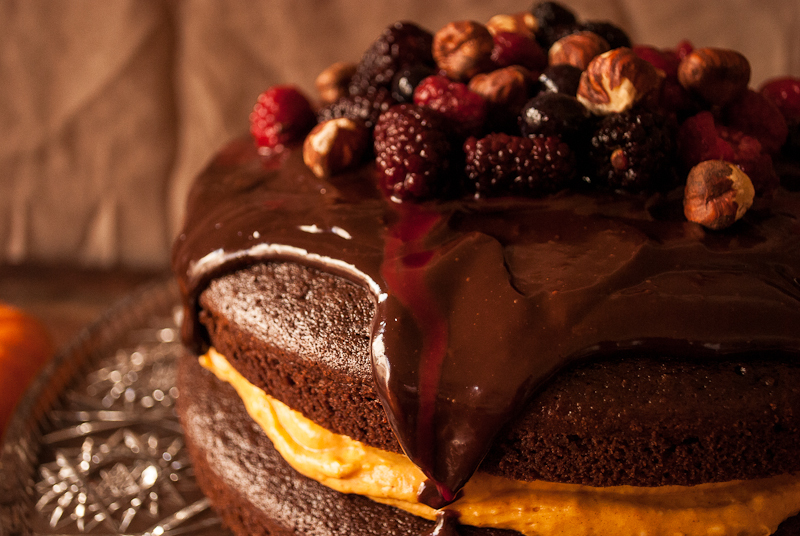 Add some berries, hazelnuts, and chocolate ganache….and voila, a chocolatey masterpiece! 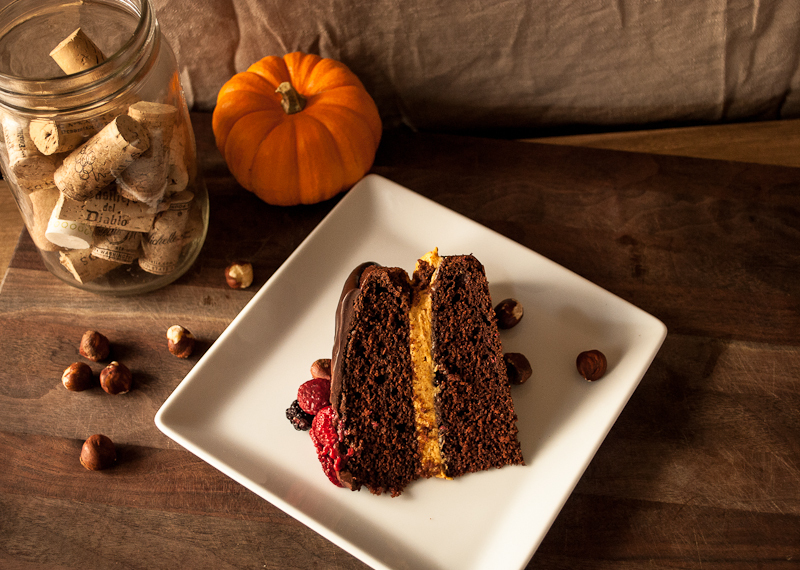 I know, another pumpkin post, but it is Fall, and pumpkin IS my favorite Fall food! Why Chocolate Harvest? Well, around this time of year, everyone is getting ready for harvest- in the Vineyards that is. As I drive thru the farms on the way to work everyday, there seems to be this peaceful, yet exciting feeling in the air. The vineyards are full of equipment, early risers are on the road scurrying to work, and the wineries are busy, busy, busy! It seems to be this last push before winter comes and everything becomes dormant and sleepy. This cake, as impressive as it looks, it’s very easy. All you need is one bowl for the mix and two 9 inch cake rounds. It takes seriously only 10 mins to mix up. The filling is cream cheese, powder sugar and some pumpkin. And for the Ganache, a little whipping cream and dark chocolate melted down. I always use Ghirardelli chocolate. I like the quality and the taste. I have been making this cake for about five years now, and it’s always a favorite at the office, potlucks, and my son even requested it for his birthday one year! Once you make this moist cake, it will be your go to recipe for sure! If you don’t have fresh berries, you can always buy the frozen ones and thaw them out before putting on the cake. 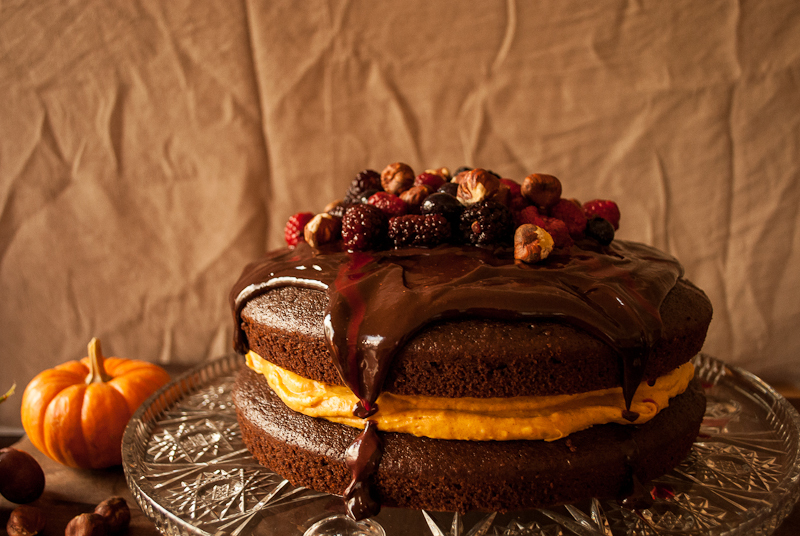 Moist chocolate cake, with a creamy pumpkin filling and rich chocolate ganache. In a large bowl, mix buttermilk, coffee, oil, sugar and egg until well combined. Then add in baking soda, salt, flour, and cocoa powder. Mix until combined. Pour into prepared cake pans. Bake for 30-35 mins. While cake is baking, make filling. With a mixer, mix cream cheese, sugar, pumpkin and cinnamon until fluffy. After cakes have cooled, make ganache. In a small saucepan over medium heat, heat whipping cream just until a boil. Remove from heat and add chocolate. Do not stir, let sit for 10 mins, then stir. 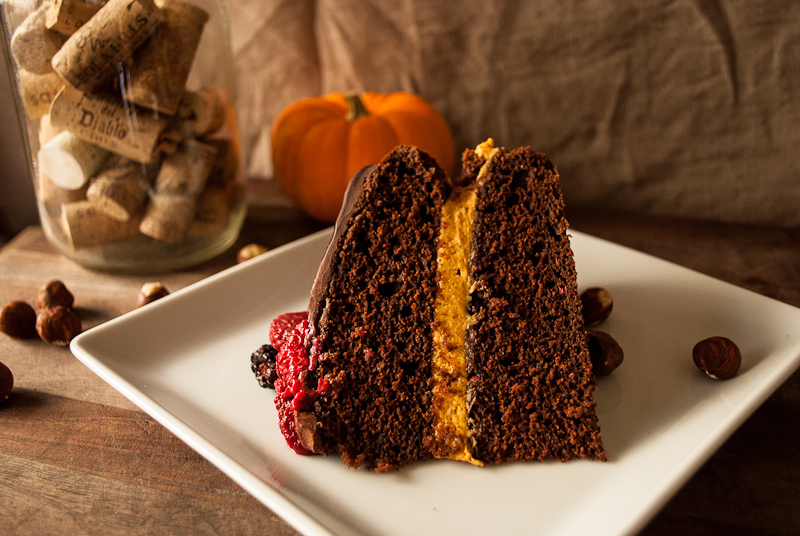 Assemble cake, place one layer on a plate, smooth pumpkin cream cheese mix on top, then place the 2nd layer on top. Pour Ganache over top of cake. Then top with berries and hazelnuts. 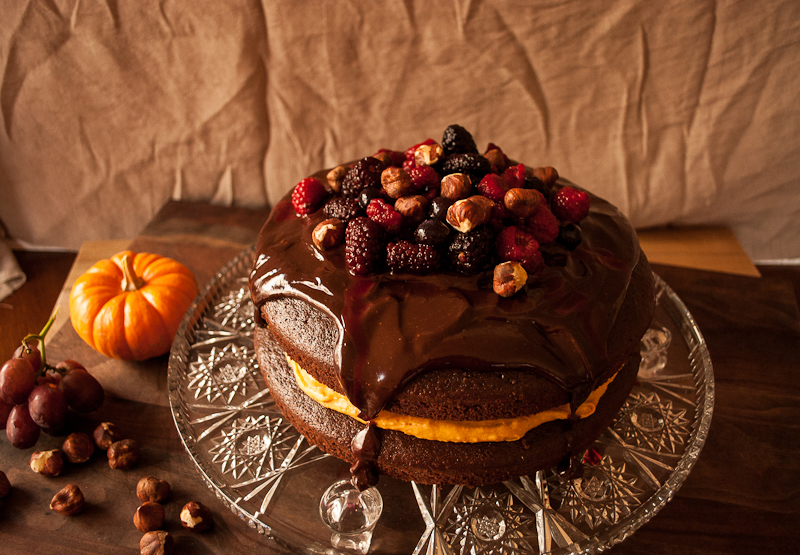 This is the loveliest pumpkin cake I have ever seen! Saw you on Tasteologie! Thanks for sharing this. Hoping to make this soon! That cake looks too pretty to eat, but eat it I will. Bring on the Pumpkin and Chocolate!! Oh my, is all I wrote when I shared it on my Facebook page. Great looking cake!! Hi Emily, I’m so glad you’re cake turned out! I have tried a few different types of chocolate..I use only Ghiradelli and I use the dark chocolate bar. For some reason the “chips” do not melt down the same, so use the bar and break into pieces. I tried Baker’s chocolate and it is too runny. Also maybe try letting your whipping cream cool longer, the longer it sits, the thicker it will become. Hope this helps! Hi Jenny, thanks for checking out my blog and trying our recipes. 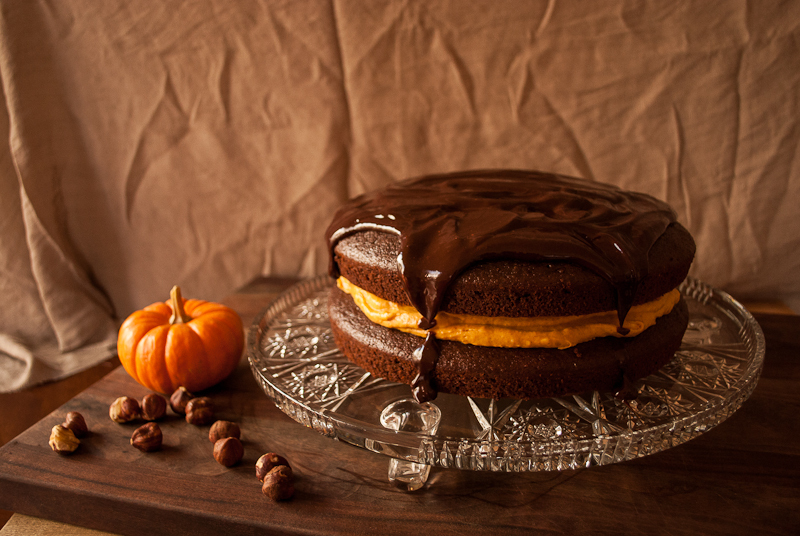 Sorry your cake did not turn out well, first off, it may be your pumpkin puree. The stuff in the cans are on the thicker side, I know when I make my own, it’s a bit runny. If you do try your own puree again, maybe use less or add more cream cheese and sugar to the mix. The Ganache can be tricky, you have to get your whipping cream to almost a boil, then add the chopped chocolate, but do not stir yet, take off the burner and let cool for 10 mins. You can let it cool longer before mixing everything together, this will help thicken- the longer it site, the thicker it becomes. Also, do not use chips, use a bar broken into pieces. Hope this helps, let me know if you have any more questions! My sister and I made this for Thanksgiving and it was a huge hit! I thought it was going to just look good but it tasted fantastic! It looks like a lot of work but it was actually pretty easy to make. And never has a dessert on my table been so photographed! We used blue berries and blackberries on top, and now I’m wondering if I could make it with a raspberry cream cheese filling in the spring instead of pumpkin? We just ate it last week but I might turn around and make it again for Christmas.